12" grease gun hose with M10 X 1 threads. (For air, battery, or hand operated grease guns). Metric thread hoses have M10 x 1 thread hose ends and high burst pressure ratings ideal for air operated guns and heavy duty use. 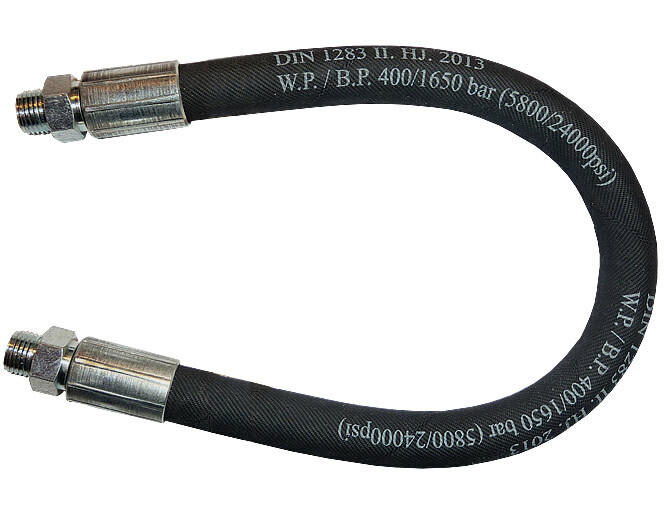 Hoses have a synthetic rubber outer layer and polyethylene reinforced double steel wire braid inner layer. Working Pressure = 5,800 PSI. Burst Pressure = 24,000 PSI.